some wanted to let it appear on the player's head the hole time, some wanted the name to appear only if you point your gun/mouse towards the player's model, some didnt wanted to see any names at all, "but that should be an option for all player's wich you should be able to adjust in the menu" "this would also reduce team killing"
- if you wanna recognize someone in real life you dont look at the person's feet, but you look at the person's face, so the player's name should be above the model's head. because the name represents who you are/look. and block weird font characters like: ().[space]^! @$1234 ect. ect. now you people are probably wondering: "but how do i show people my clan name/tag"
Last edited by Dragonathan on Mon Dec 11, 2006 1:31 pm, edited 1 time in total. because the color coding relies on ^(code letter/number) to identify it. also, tags are there to be in your name and flash around. and many people, out of sheer laziness, would ignore the system. another thing for identifying. squads usually have people of different builds, and they have thier names on thier backs. after training for hours on end, you learn to figure out who's who. i think that would be difficult to code, unless the devs are capable to make the names look like real material textures. names on the uniforms would just be a pure eye-candy, and it wouldnt be functional, i understand that eye-candy's dont need to be functional at all... but having player's names on the back would be over-do, and its also not really realistic, i dont mind game fictions but having names on uniforms is just too conspicuous, unless the names would appear very small on the uniforms than i wouldnt mind that. and you can only see the name on the backside of your team mate. so you still could teamkill your team mates when theyre not turning their backs. the reason that i suggested a better naming system is pure for the teamkill prevention. Last edited by Dragonathan on Thu Dec 14, 2006 8:40 pm, edited 2 times in total. The quickest way to fix the name issue with those special characters is to disable the names from showing in the first place. If the game is to be more realistic and immersive, removing hud displays, this includes the names over the heads, is the best and only option. huds has nothing to do with realism, as i said before, a game without hud is like playing chess with out a chess board. huds is like an artwork that ornaments the hole game design, its a little bit extra, it shape up the game. a game with out interfaces/huds/additional features makes evrything feel bald and empty. Realism is not a goal of any TomClancy game. If that is the case then make the hud look as good as you want. 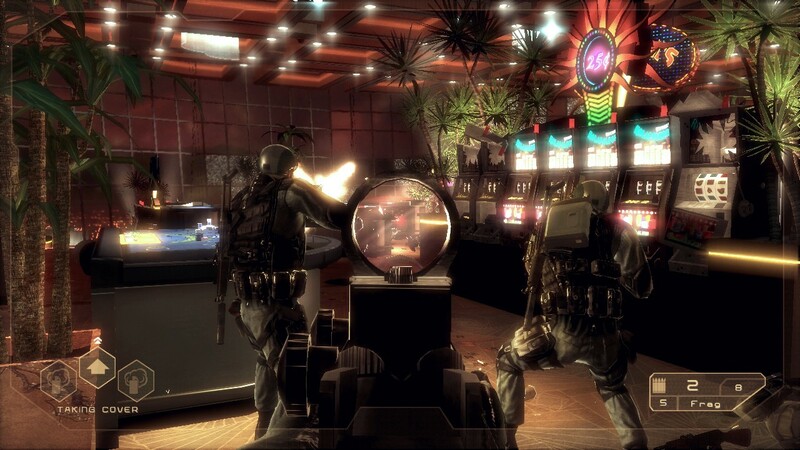 its more realistic than TC:E, and rainbow six vegas has a more crowded hud/interface than tc:e, so huds has nothing to do with realism at all. and what about Call of Duty, Brothers in arms, hyper realistic games, they have huds too you know.. and trust me the developers of those games know what they are doing, although i must say that i like the hud designs of TomClancy's games more, but the point is, game developers add hud's for the functionality, and also game design, it makes evrything look fancy"it all depends on the interface designer ofcourse"
hud's ease up new players, if hud's wasnt so importent than why are all the game developers still using Hud's? hud's gives the game-design more characteristics. the original rainbow six was realistic. now, it has grown away from realism does it have ironsights? yes. do you die easily? yes. do game critics, as well as many experts on tactical gaming, agree that it has grown to be unrealistic? yes. (see also: http://dslyecxi.com/bestoftactical.html , it has been linked a million times before, however, it is among the best pages on realism in games. it has grown away from realism, do you die easily? yes. .
Last edited by Dragonathan on Fri Dec 15, 2006 4:02 pm, edited 3 times in total. I agree the damage per bullet could be made higher. however, I would say handgun rounds should stay the way they are, except for a little increase for headshots. also, I don't make sense? try listening to yourself sometimes. it is VERY hard to understand you. yes, I do wander around a bit in posts, but for the most part, I try to keep things organised together with similar items. anyhoo, back to naming things. as it is, I think the naming system is OK, it could be tweaked, but I think it could wait until the major things are implemented and had final decisions (freeaim, new weapons, etc.) before a review. however, one feature I would like, is after spotting a person (having them them near the center of your screen for a few seconds, then having the mane pop up) the name stays with them until they leave your view. Realistic isnt part of the RainBow Six series nor is it part of any tomclancy game. It only looks realistic because of its graphics and its tactical team gameplay. Beyond its shell, R6 and the rest of the TC games are all unrealistic beyond your imagination. The only realistic tactical team game ever made is Full Spectrum Warrior - it may not be anywhere near the photorealistic graphics of the TC games but its gameplay is as close to as real as you will get plus it is authentic. Another game like that is Close Combat First to Fight, these two games, plus America's Army, Armed Assualt, and Operation Flashpoint are some of the very few games that represent authenticity, realism, and the serious topic of war and combat. Every other game was only made to entertain - primary reason to provide the savage violence of war into a form of easily digestable arcadish fun or even so-called realistic combat. I like R6 however, but I will never call it realistic.